DRUSY or DRUZY CRYSTAL - thought forms ready to spring forth and grow - PaganSquare - PaganSquare - Join the conversation! Drusy may be present on points (like the one above) or on the points of fully formed clusters or they may be simply present on a matrix, these are called Drusy Clusters. The Drusy clusters consist of tiny crystal points in their very formation, and may be encrusted sandstone, quartz or other mineral matrices. I like to call it “Sugar Drusy” because the tiny crystals making up the Drusy look like sugar crystals. Often you will see tiny quartz Drusy growing on agate and inside geodes. 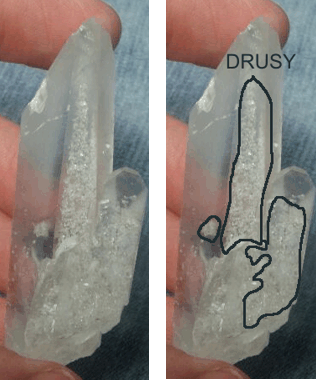 Basically, you could think of Drusy in stages of crystal growth. Drusy is the tiniest crystal on crystal formation (looks like sugar, or glitter, from fine grain to chunky), next would be Barnacles (tiny to small points), both of which lay on the surface, and finally would be Inner Child and Bridges (larger points which penetrate). Lot of times you will see Drusy oriented all on one direction of a point or cluster (kind of like you see moss only on one side of trees in a particular forest). See how the crystal below doesn't have any Drusy on the front-side, but the backside is covered (all the bright white is Drusy, except the larger points within that white, which are Barnacles). Here's a crystal which has both Barnacles and Drusy. I have drawn a line around the Barnacles and a line around the Drusy. Basically the only physical difference between Drusy and Barnacles is size. 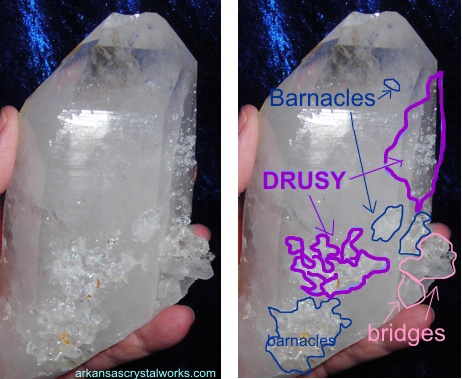 Here's another example of the way Drusy will grow on a particular side. This crystal also has Bridges. While it is true that the only physical difference between Drusy and Barnacles is size, there is a difference in them energetically. As we discussed in the blog post on Barnacles, they are crystals (new souls) attracted to an old soul crystal for the wisdom and teaching the larger/older crystal holds. Drusy is often present on crystals with Barnacles, but the Drusy crystals to me feel more ethereal, amorphous, less driven than Barnacles. They have a soft, subtle and magical energy. When would a person choose to work with the energy of Drusy crystals? Drusy crystals assist with ideas or thought forms ready to spring forth and grow. To me, thoughts which aren't quite plans are similar to Drusy. If you have a seed of a thought or dream, desire or wish, you might choose to work with the energy of Drusy crystals. 1. MEDITATE TOGETHER you may want to meditate with your crystal, it is best to cleanse, clear and program your crystal with specific intent so you both are on the same page. 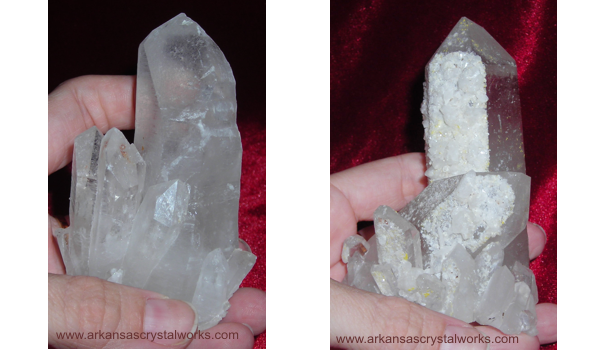 I find that if I am working with a crystal with a particular feature I will put my finger on, or rub the feature in question as I work with it. It helps to activate that particular energy. 2. 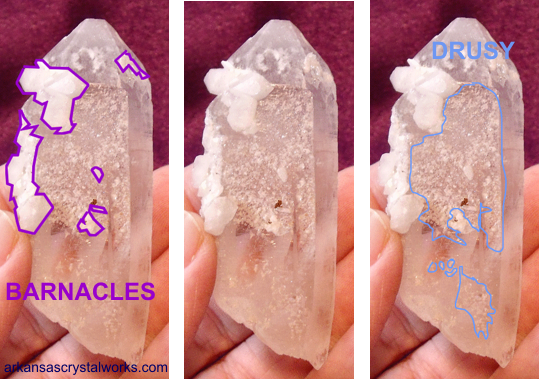 MAKE A GRID you may want to make a grid, featuring the crystal with the configuration to assist that energy. If you only have one of that type, then place this crystal in the center of the grid, if you have more than one, you can put them at the cardinal points as well as the center, etc. Same applies to the grid as the meditating as far as cleansing, clearing and programming. 3. CARRY IT WITH YOU you may want to wire wrap your crystal or carry it in a pocket or medicine pouch, cleansing, clearing and programming applies here as well. The main thing to take away from this is that the crystal will assist you, but you must be an active participant in the work with your crystal. It is a co-creative endeavor. Simply having the crystal will not automatically work without your active involvement. I think this is the reason so many "non-believers" or "nay-sayers" scoff and say that crystal healing or working with crystals is bunk. Because it IS true that to expect that simply obtaining said crystal and expecting it to turn things around for us magically and without effort on our part IS bunk. As much as it would be bunk to think that simply buying a hammer and putting it in the tool shed will magically nail all your boards together and build your house. Always, always remember we are working WITH our crystal friends. Drusy falls into the category of crystals on crystals. It consists of very small points that are described as “a myriad of very closely set tiny crystals”. It may grow on a variety of places, including points, clusters, matrix, agates (other minerals) or inside geodes. Drusy crystals' energy is ethereal and amorphous, and they have a soft, subtle and magical energy. Drusy crystals assist with ideas or thought forms ready to spring forth and grow such as thoughts or dreams, desires or wishes. Drusy crystals have a soft, subtle and magical energy. See you next week for Eight-Sided face or Grounding quartz crystals. Druzy crystals are well shaped tiny crystals which create a magical stunning effect when used in the ornaments. The exquisite glittering cave is extremely fascinating that leaves a good impression to the others. As the druzy crystals are well-shaped tiny crystals, I really like them a lot. One day I asked to my father a druzy pendant as a present on my birthday. Surprisingly, I gifted me with a beautiful druzy pendant which I love to wear occasionally. I told me that he bought it from http://www.navneetgems.com when asked.